Our 2nd annual bird photography contest. FREE to enter, and anyone can do so. 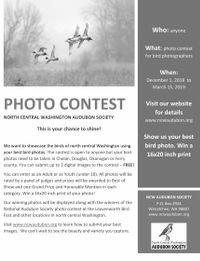 Your bird photos must be taken in Chelan, Douglas, Okanogan or Ferry counties. Contest entry closes March 15, 2019. More entry details are provided on our website, www.ncwaudubon.org.